I have to admit I have been stuck in a bit of a blogging rut. My goal with LDB is to share with you all what I love and recently I have been lacking inspiration and direction. 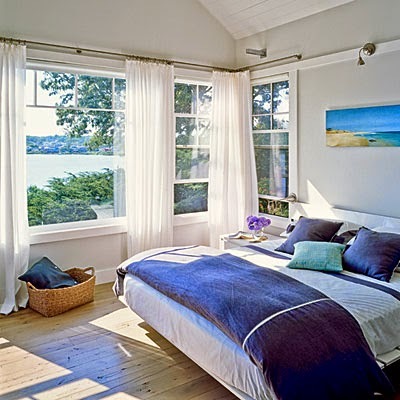 I took to Pinterest last night in search of something that spoke to me and came across an article on Coastal Living showcasing bedrooms with stunning ocean views. There is nothing better than living beach side and I couldn't think of a better view to wake up to than one of the ocean. 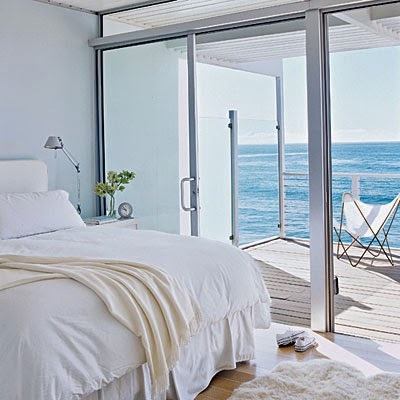 These bedrooms in Malibu, Laguna Beach and Martha's vineyard have different design styles from classic to contemporary but share one thing in common - the stunning ocean view! I love this Laguna Beach guest room with warm, neutral tones that are echoed in the simple rounded headboard and rattan dressers. These pieces complement the room’s ornate details, such as the antique mirrors and crystal chandeliers, which reflect light from the breathtaking view just outside. This Martha’s Vineyard home was built with views of the outdoors in mind. This relaxed master bedroom with simple furnishings and rustic wooden floors affords views of Vineyard Haven. This neutral California bedroom blends seamlessly with the outdoors. The white colour palette and minimal furnishings allow the view to be the true star. This Master suite in Malibu features dark, soaring vaulted ceilings and is furnished in warm tones.